LOS ANGELES (KTLA) -- A Los Angeles jury Monday sentenced the man convicted in the "Grim Sleeper" serial killings to death, the Los Angeles Times reported. The jury was weighing a possible death sentence for 63-year-old Lonnie Franklin Jr., who was found guilty last month on 10 counts of murder and one count of attempted murder in the deaths of nine woman and a 15-year-old girl over more than two decades. A jury comprised of seven women and five men deliberated for 1 1/2 days before returning the verdict on May 5. Sentencing was expected to take place around 12:30 p.m. Monday at the Clara Shortridge Foltz Criminal Justice Center in downtown L.A., according to the court's public information officers. Prosecutors were seeking the death penalty in the case. 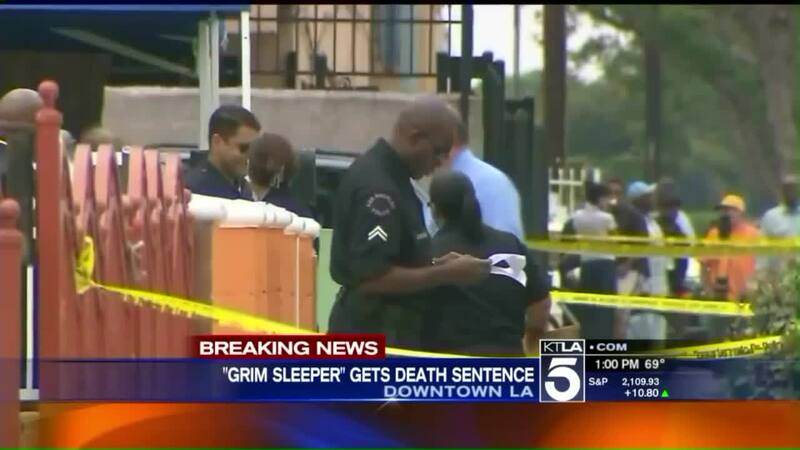 Franklin, a former city sanitation worker, was convicted of killing the female victims between 1985 and 2007; the gap between homicides prompted the "Grim Sleeper" nickname. He was arrested in 2010. Prosecutors said the victims were raped before being shot or strangled. Their bodies were then dumped in South L.A.
All of the victims were found in alleys, covered in debris, thrown into trash containers or dumped into bushes, a news release from the L.A. County Deputy District Attorney's office said following Franklin's conviction.